Niall Griffiths surely has to be one of the greatest, and curiously unknown, British writers of the last decade. He appeared in 2000 with the sprawling, epic ‘Grits’, a novel that astounded with its stylistic prowess – somehow like a cross between Irvine Welsh, Cormac McCarthy and, at times, hyper-saturated language worthy of Iain Sinclair. Focusing on the British underclass of the 1990’s, the power of landscape on the psyche, British politics and class divisions, the appeal of drug taking and raving, myth and legend, and much more; the novel remains, for me, one of the greatest books of the last few decades. He followed this with a string of excellent novels – ‘Sheepshagger’, ‘Kelly + Victor’, ‘Stump’, ‘Wreckage’ and ‘Runt’ – all of which explored in various different ways the themes laid down in that first novel. All are highly recommended. 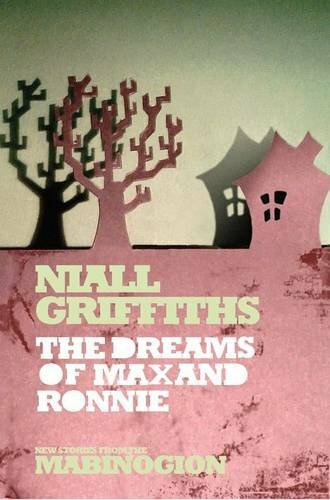 Now we have Griffiths’ latest fictional offering, ‘The Dreams of Max and Ronnie’, as part of Seren Press’ ‘New Stories from the Mabinogion’ series, which has also featured other Welsh poets and writers such as Gwyneth Lewis, Owen Lewis and Russell Celyn Jones. For those who are unaware, The Mabinogion is the great story cycle of Welsh mythology (otherwise known as The Four Branches of the Mabinogi). This series has asked contemporary writers to reinvent stories of their choosing from The Mabinogion and give them contemporary relevance; this fits in perfectly with the work of Niall Griffiths who has long drawn on the power of mythology and storytelling in the British Isles (often pre-Christian) and linked them in with his very modern themes. Thus we get ‘The Dreams of Max and Ronnie’, two short novellas, the first being a reworking of the old Welsh Myth ‘Breuddwydd Rhonabwy’ that becomes here ‘Ronnie’s Dream’. A blistering, raging piece addressing recent British foreign politics, namely the Iraq War, the story tells of squaddie Ronnie, who is set to ship out to Iraq in a week. Before they go, he and two friends go out on one last bender, where Ronnie takes a pill that knocks him out for three days and three nights. Whilst unconscious he walks through a nightmarish dreamscape of modern Britain, where figures such as The Beast of Britain and The Grinner (guess who?) play video games while sending thousands of young men to die, crowds desperately emulate the tattoos and haircuts of the rich and famous and anyone who differs in opinion is violently beaten or simply ignored.